Sailing - 02. December 2018. Twelve of the world’s top women’s match racers started competition on Thursday in the 2018 Women’s International Match Racing Series (WIM Series) Finale, hosted at the Carlos Aguilar Match Race (CAMR). After three days of racing, there are four teams – Sweden’s Johanna Bergqvist and Anna Östling, the Netherland’s Renee Groeneveld and France’s Pauline Courtois – left at the top of the leaderboard who will vie for the championship title on Sunday in a progression of semi-finals, petite-finals and finals. The elimination process started mid-morning, when after 22 flights of the full round-robin, the top eight teams advanced to the quarter finals and the bottom four sailed a consolation round. Thus, it was a day of lows for some teams and highs for others, much like a weather where dark rain squalls mid-day cleared to a sunlight afternoon with champagne sailing conditions. The USA’s Janel Zarkowsky’s As One team of Isabelle Ruiz de Luzuriaga, Katie Olsen and Rose Edwards made the cut into the quarter finals and lost a spot in the semis following a defeat to France’s Courtois. “This is our first event together as a team and our goal was to get into the top eight, which we did. In the quarter finals, we had some spicy racing against Pauline (Courtois). What I really enjoy about match racing in general is the pre-start, and the pre-start against Pauline was intense. We both know the basics and the rules well, so we play off each other really well. We really got our money’s worth in the quarter finals,” says Zarkowsky, who plans to compete in WIM Series events in 2019. Sweden’s Linnea Floser, whose Peregrine crew includes Hanna Ericksson, Sarah Ragle and Ann Johnson, were another team that hoped to make it into the quarter finals. While they didn’t make the cut, they did win the four-team consolation round. Following Floser in ninth in the consolation round is the USA’s Morgan Collins tenth and Sweden’s Sanna Mattsson and Helena Nielsen in eleventh and twelfth, respectively. Known internationally for introducing young sailors to the sport, CAMR organizers work cooperatively with the V.I. government and V.I. Department of Tourism in its efforts to get more of the island’s youth out on the water. As such, the CAMR Youth Regatta took place today. 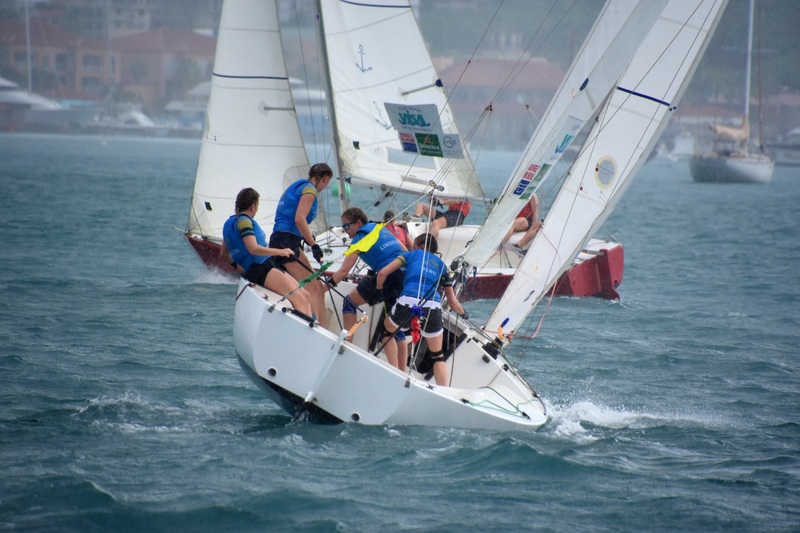 Eleven members of the Boys & Girls Club of St. Thomas-St. John, who have also been enrolled in the Marine Vocational Program, served as crew for the women match race skippers in a best of three fleet race. The 2018 WIM Series Finale at the Carlos Aguilar Match Race concludes on Sunday. Racing starts at 9 a.m. local time.